Beautifully embroidered gifts made special with her personalised name on bath towels, hand towels, gym towels, handkerchiefs, blankets, cushions, scarves and more. Personalised Pink Chefs Apron. A classic bright pink coloured apron that is a great gift for ladies of all ages. 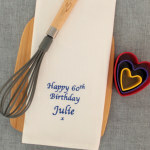 Personalised Chefs Apron - Embroidered with custom circle swirl monogrammed initials. Eco cotton Hippie Chick style black sling bag custom embroidered with a floral forest wolf design. Eco cotton Hippie Chick style bubblegum pink sling bag custom embroidered with elegantly written Love and hot pink heart motifs.